"The biggest building you may never use"
"Rental car facility runs smoothly, with consultants’ help"
"MEP systems designed to fit big spaces"
"Moving sustainability forward at Sea-Tac Airport"
"Structural design lends flexibility to rental car firms"
"Art adds color to massive concrete structure"
"Design drives rental car facility"
“Veiled Carbon” by Buster Simpson is one of several art pieces found at the Port of Seattle’s Consolidated Rental Car Facility. Simpson’s work functions like a theatrical scrim to shroud the facility’s two helical ramps. Bus passengers load and unload under a covered entry. The ceiling in the rental area has a curved shape like an airplane wing. About 3,900 construction jobs were created. 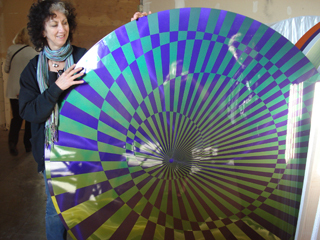 Artist Linda Beaumont inspects her work. 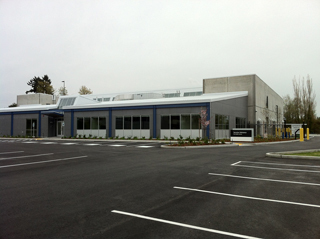 An off-site bus maintenance facility was part of the project. 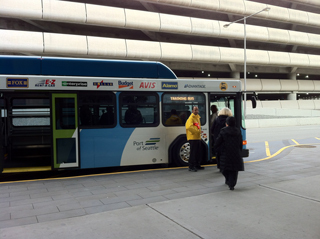 Buses running on compressed natural gas will shuttle customers between the RCF and the airport. The RCF obtained a silver rating under the LEED New Construction version 2.2 rating system. 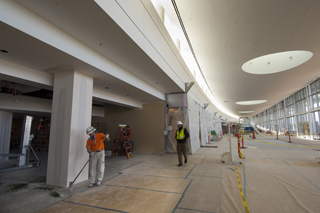 There will be two LEED plaques showcased at the north and south elevator cores on level five of the facility. 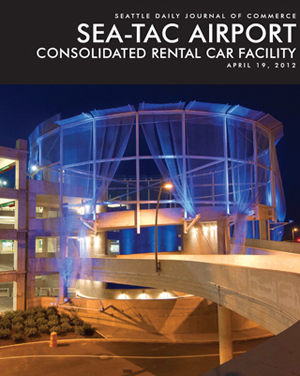 The RCF was designated the port Aviation Division’s sustainable demonstration project in 2005 during the preliminary engineering phase. The goal was to implement a “total cost of ownership” decision-making framework during design that would positively impact construction and operation of the facility in a non-LEED format. 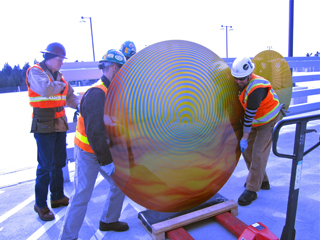 The project used life-cycle cost analyses as evaluation criterion for major equipment and systems, eco-charrettes, and guiding principles of “right sizing” the facility as strategic measures. A LEED checklist was used as a guideline during the preliminary and final design. After the 60 percent design submittal, the project team recommended a LEED certified rating (minimum 26 credits). As the design was completed and construction began, the team realized the project could possibly obtain up to 36 points, exceeding LEED silver certification. It eventually received 34 credits. Currently, the Port of Seattle’s project is the largest RCF in the nation to receive a LEED silver rating. 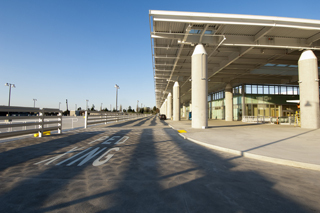 The Santa Barbara Airport RCF, significantly smaller than Seattle’s, obtained a LEED NC 2.2 gold rating in 2010.